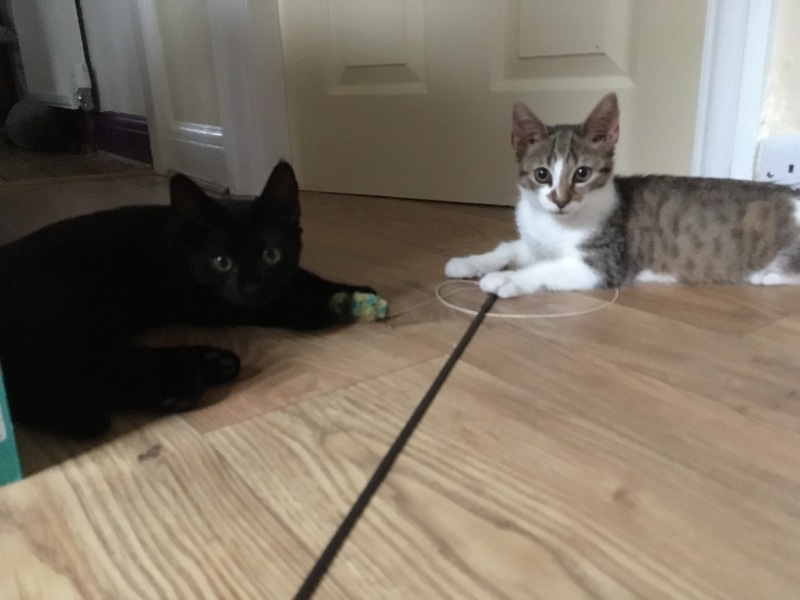 Last week we brought you the positive story of Henry & Harvey (previously Green and Pink) moving downstairs and growing in confidence and purrs. We promised an update on their brothers Yellow & Purple (now Herbie & Hector). The hope was that they’d play happily with Isaac and his confidence and purriness would rub off on them. However … as happens in cat rescue … it got complicated. Little Herbie hurt his hand/arm … possibly an insect bite .. and needed to take things a bit steady. Isaac was too boisterous and Hecate started to object. Isaac was given a single room, but cried most of the night through loneliness (I know this as my bedroom is next door). A friend contacted me about a kitten who was being hurt by children in his family and needed out … fast. I said yes because it was a friend, and a scared kitten. Brought him home, without a precise plan for where he’d go. 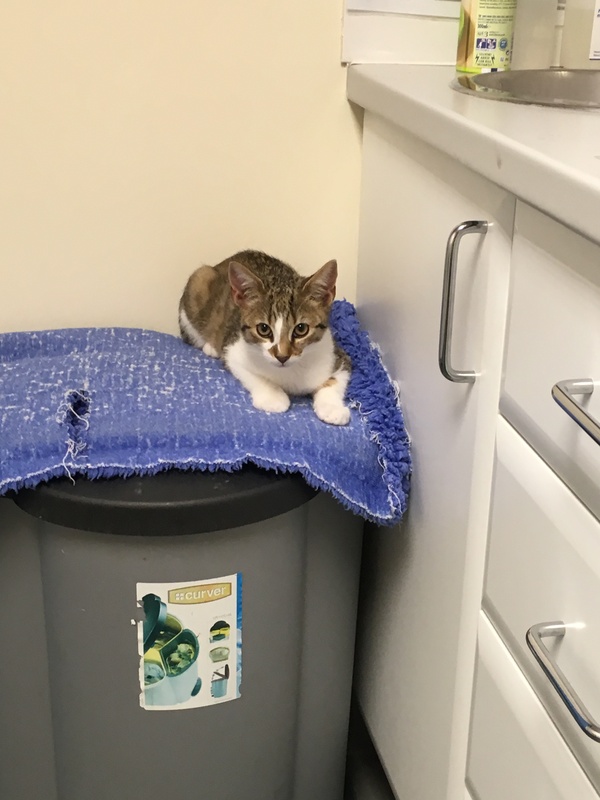 He growled and growled and hissed, and when he went to the vets later they diagnosed him with a nasty case of ear mites and advised he be kept away from the other kits …. for 3 weeks! I wonder how many people lay awake at night thinking about their house and the various doors in it in quite the way that we do. Endless turning over permutations of space and who has access to where. Anyway … we came up with a plan. Theo on his own in the little bedroom, so he keeps his ear mites to himself. Isaac and Hecate in the back bedroom, as they’ve got along ok. Then all the H Team kittens downstairs, Herbie & Hector initially in a crate and then just in the extension so Herbie could rest his leg and they gradually gained confidence with more space. Yes! The endless turning of maddening puzzle … with a little blue sky thinking …. gives us a solution. Lots of cleaning, changing litter trays, moving favourite beds around. The first thing we noticed was that the now divided H team no longer recognised each other and were hissing lots. 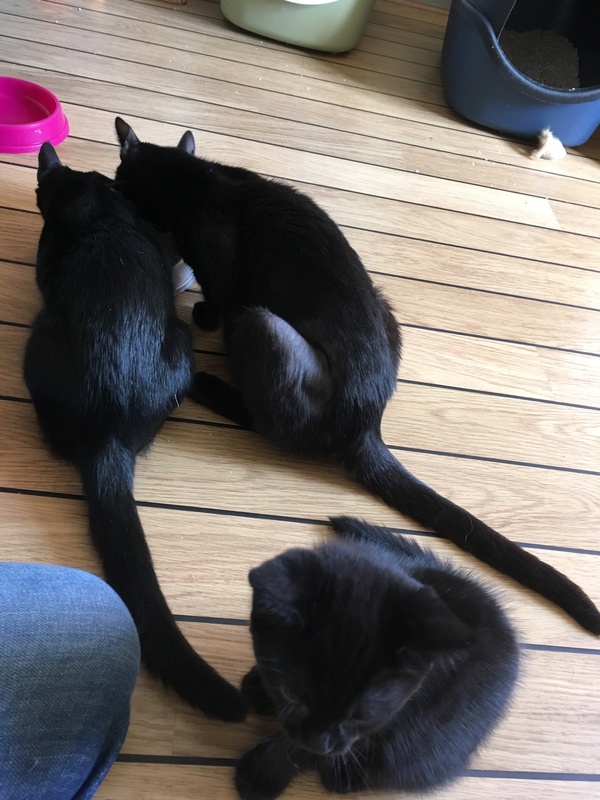 I’d probably been a bit optimistic hoping that the residents wouldn’t notice that there were now 4 little black kittens sharing their space rather than 2. We persisted for a while. Hissing and growling usually settles after a few days with kittens. However Theo sobbed his socks off being alone in the little bedroom, Hecate blamed Isaac for her kittens having been taken away and they started scrapping. Herbie and Hector’s cries downstairs could be heard by Hecate upstairs when all the windows were open (covered with cat safe netting of course) and they howled back and forth to each other. Struggling with concerns about how rehomeable Herbie and Hector would be if they spent too much longer with mum’s negative opinions, but heartbroken by the cries between mum and babies, we caved in. Took the kits back upstairs to mum at which point she claimed that it wasn’t these kittens she wanted, she’d never seen them before and started hissing at them and pushing them away from her. FFS! It’s really late at night by this stage and I have to be at work in the morning! Watched them for a while on CCTV (thank goodness we have that option) decided they’d be ok, though laid awake most of the night listening to check. Of course Isaac then had to come out of there. And go where exactly? A leap of faith and a jump of desperation led to us putting an Advocate on him to protect from ear mites and rooming him with Theo. After all the growling that was going around it seemed a bit ridiculous to think they might be ok together. More watching of CCTV. Amazingly and thankfully these guys have just been happy friends. They play at prodding and poking each other but it’s just normal kitten games.